Tiffany and Lupus: Lupus Cheerleaders? RAH RAH RAH! Lupus Cheerleaders? RAH RAH RAH! How are you my sweets? Hope everyone is managing to stay warm as the season gets colder. I didn't realize just how chilly New York City has become until the frosty morning of November 7th; day of the ING New York City Marathon! In which there were 38 runners supporting the S.L.E. 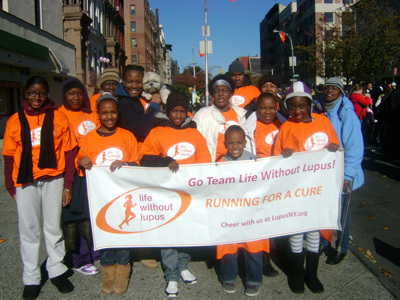 Lupus Foundation; running on team 'Life Without Lupus'! RAH!I'm cheering in Upper Manhattan! I geared up in "lupie winter fashion" & headed out to 92nd street and 5th avenue to cheer on the 38 runners on team 'Life Without Lupus'. It was often hard to catch them in photos because they were SO fast; I could tell they were 100% committed to their cause! I specifically remember one runner; his name is Drew. As he approached my cheer spot I noticed he looked drained. His eyes a bit unfocused. I sucked in all the air I could manage and bellowed "Come On Drew, you got this! Go Team Life Without Lupus!" and stretched my arm out to clap his hand as he passed me. It was like a million watts lighted up his face as he put slapped my palm and put extra pep in his step! It was the least I could do, and now I'll forever remember that moment. From lupus patient to "runner for lupus"! Team 'Life Without Lupus' proudly represents in New York City & across the globe; and the ONLY lupus organization to host a team in the ING New York City Marathon! There were several "cheer teams" spread across the city. The first beginning in Brooklyn, several in lower/upper Manhattan, and one in Harlem. All with the goal to cheer, support, and encourage all 38 runners who courageously set off on a chilly NYC morning to run 26.2 miles for a great cause! Together they raised an amazing total of $130,000 in support of patient services & research to find a cure! When I'm having a particularly crummy day news like this helps to smile another day. I may not be healthy enough to run a marathon for my illness; but there are lots of people out there who are doing it FOR us, and thats a blessing in itself! The New York Daily News wrote a moving story about a Team Life Without Lupus runner: “Shawn Gates won't let lupus catch up with her; she plans to use Marathon as fund-raiser to find cure” You can read about Shawn's story HERE! Shawn Gates "Life Without Lupus Runner"
You can even view footage of the runners on the Team Life Without Lupus Facebook page! Wonder where all the funds are going? Take a peek over at S.L.E. Lupus Foundation to see the latest lupus news & all the amazing support services they offer lupus patients and their families. Learn different ways YOU can help in the fight against lupus! You're welcome! I couldn't agree with you more! Hi! I have a hard time looking for this writing, I am using it for my project, please don’t stop to post new interesting idea. waiting for your upcoming posts. Good Luck! What a amazing blog post is this and absolutely it makes understand every and everyone who read this. Please keep providing so incredible and cute ideas ….I in fact express thanks for it. Great articles you’ve always shared with us. Case of the "Prednisone Blues"!